^ Japanese: スーパーマリオ64, Hepburn: Sūpā Mario 64? ^ "Super Mario 64". GameSpot. CBS Interactive. Archived from the original on February 14, 2018. Retrieved February 13, 2018. ^ a b c d "Full Coverage - Super Mario 64". Nintendo Power. Nintendo (88): 14–23. September 1996. ^ a b c d e f Official Super Mario 64 Player's Guide. Nintendo. 1996. ^ "NG Alphas: Super Mario 64". Next Generation. No. 20. Imagine Media. August 1996. p. 53. ^ "Nintendo 64 Shakes Up Shoshinkai". GamePro. No. 90. IDG. March 1996. p. 22. ^ a b c Super Mario 64 Instruction Booklet. Nintendo. 1996. NUS-NSME-USA. ^ Princess Peach's note: "Dear Mario: Please come to the castle. I've baked a cake for you. Yours truly-- Princess Toadstool, Peach." Nintendo EAD (September 29, 1996). Super Mario 64. Nintendo 64. Nintendo. ^ Princess Peach: "Mario! The power of the Stars is restored to the castle... and it's all thanks to you! Thank you, Mario. We have to do something special for you... Listen, everybody, let's bake a delicious cake... for Mario..." Nintendo EAD (September 29, 1996). Super Mario 64. Nintendo 64. Nintendo. ^ IGN Staff; Miyamoto, Shigeru (March 18, 1999). "GDC: Miyamoto Keynote Speech". Archived from the original on October 24, 2017. Retrieved October 23, 2017. ^ a b c d Miyamoto, Shigeru; Tezuka, Takashi (January 1996). "The Game Guys - (Shoshinkai 1995)". Nintendo Power (Interview) (80). Nintendo. Archived from the original on February 24, 2011. Retrieved May 25, 2014. ^ a b "IGN Top 100 Games 2007: 5 Super Mario 64". IGN. 2007. Archived from the original on February 20, 2012. Retrieved February 13, 2018. ^ Grajqevci, Jeton (October 9, 2000). "Profile: Shigeru Miyamoto - Chronicles of a Visionary". N-Sider. Archived from the original on February 24, 2011. Retrieved February 14, 2018. ^ "Dylan Cuthbert". Twitter. Archived from the original on May 25, 2014. Retrieved May 25, 2014. SNES Central @dylancuthbert I'm researching unreleased SNES games, was a game called "Super Mario FX" ever in development? Dylan Cuthbert @snescentral no, that was the internal code name for the FX chip"
^ McFerran, Damien (July 4, 2013). "Born slippy: the making of Star Fox". Eurogamer. Gamer Network. Archived from the original on July 6, 2013. Retrieved July 4, 2013. ^ Andretti (August 5, 1997). "ACCL Message Board - Msg: 1910481". Silicon Investor. Knight Sac Media. Archived from the original on September 9, 2017. Retrieved February 14, 2018. ^ "Mario 64 once had a co-op mode". Destructoid. Archived from the original on March 7, 2012. Retrieved August 30, 2011. ^ Alexander, Leigh; Boyer, Brandon (November 27, 2007). "MIGS 2007: Nintendo's Koizumi On The Path From Garden To Galaxy". Gamasutra. UBM. Archived from the original on November 12, 2017. Retrieved February 14, 2018. ^ "Shigeru Miyamoto: The Master of the Game". Next Generation. No. 14. Imagine Media. February 1996. pp. 45–47. Personally, I wanted to make a game that looks like a 3D interactive cartoon. I wanted to create a small garden where Mario can meet realtime 3D characters and the player would be able to move the character with the controller just as if it were a real cartoon. ^ "Nintendo's Lincoln Speaks Out on the Ultra 64!". Electronic Gaming Monthly. Ziff Davis (78): 74–75. January 1996. ^ "Nintendo's Yamauchi Speaks Out". Next Generation. No. 20. Imagine Media. August 1996. p. 30. ^ "Super Mario 64 - Original Game Soundtrack". AllMusic. Complex Media. Archived from the original on February 15, 2018. Retrieved February 14, 2018. ^ "Super Mario 64". Nintendo Power. Nintendo (89): 67. October 1996. ^ Staff (February 12, 1999). "Milia News; ECCSELL Awards Name Winners". GameSpot. Archived from the original on August 30, 1999. Retrieved January 5, 2019. ^ "All Time Top 20 Best Selling Games and More". Ownt. May 21, 2003. Archived from the original on June 14, 2007. Retrieved February 14, 2018. ^ Thorsen, Tor (June 5, 2007). "Wii VC: 4.7m downloads, 100 games". GameSpot. CBS Interactive. Archived from the original on February 14, 2018. Retrieved February 14, 2018. ^ "Super Mario 64". GameRankings. CBS Interactive. Archived from the original on February 15, 2017. Retrieved February 14, 2018. ^ "Super Mario 64". Metacritic. CBS Interactive. Archived from the original on March 12, 2018. Retrieved February 14, 2018. ^ Marriott, Scott Alan. "Super Mario 64 - Overview". AllGame. All Media Network. Archived from the original on December 6, 2014. Retrieved February 14, 2018. ^ a b "Super Mario 64". Edge. No. 35. Future Publishing. August 1996. pp. 68–71. ^ a b "Super Mario 64". Electronic Gaming Monthly. Ziff Davis: 189. January 2004. ^ a b Orland, Kyle (October 24, 2007). "Famitsu gives Super Mario Galaxy 38/40". Engadget. AOL. Archived from the original on December 12, 2017. Retrieved February 14, 2018. ^ a b c d "Retro Review - Super Mario 64". Game Informer. Cathy Preston (171): 114. July 2007. ^ a b "Super Mario 64 Review". GameSpot. CBS Interactive. December 1, 1996. Archived from the original on February 15, 2018. Retrieved February 14, 2018. ^ Perry, Doug (September 25, 1996). "Super Mario 64 Review". IGN. Ziff Davis. Archived from the original on August 6, 2017. Retrieved February 14, 2018. ^ a b c "Maximum Reviews: Super Mario 64". Maximum: The Video Game Magazine. Emap International Limited (7): 116–7. June 1996. ^ a b "King of the Hill". Next Generation Magazine. Imagine Media (21): 147. September 1996. ^ "IGN's Top 100 Games of All Time: 10-1". IGN. 2003. Archived from the original on May 11, 2015. Retrieved February 13, 2018. ^ "IGN's Top 100 Games: 10-1". IGN. 2005. Archived from the original on May 11, 2015. Retrieved February 13, 2018. ^ "The 100 Best Games To Play Today: 5-1". Edge Magazine. Future Publishing. March 9, 2009. Archived from the original on October 29, 2014. Retrieved February 14, 2018. ^ "The 100 Greatest Computer Games of All Time". Yahoo! Video Games. Archived from the original on July 31, 2005. Retrieved February 13, 2018. ^ "NP Top 200". Nintendo Power (200): 58–66. February 2006. ^ "The Best of '96". Electronic Gaming Monthly. No. 92. Ziff Davis. March 1997. pp. 82–91. ^ "The Essential Buyers' Guide Reviews". Maximum: The Video Game Magazine. Emap International Limited (7): 115. June 1996. ^ "Super Mario 64 Review". Game Informer (40). August 1996. ^ a b "ProReview: Super Mario 64". GamePro. No. 97. IDG. October 1996. pp. 74–75. ^ "Now Playing - September 1996". Nintendo Power. Nintendo (88): 94–97. September 1996. ^ a b c "The Essential 50 Part 36: Super Mario 64". 1UP.com. Archived from the original on March 28, 2016. Retrieved February 13, 2018. ^ Etherington, Daniel (October 25, 2003). "Platform video games evolve". BBC News. BBC. Archived from the original on June 17, 2004. Retrieved February 14, 2018. ^ Krantz, Michael; Jackson, David S. (May 20, 1996). "Super Mario's Dazzling Comeback". Time International (South Pacific ed.). Time, Inc. (21). Archived from the original on January 28, 2015. Retrieved January 23, 2015. ^ "Top 100 Games of All Time". Next Generation. No. 21. Imagine Media. September 1996. p. 71. ^ Gerstmann, Jeff (November 20, 2006). "Super Mario 64 Virtual Console Review". GameSpot. CBS Interactive. Archived from the original on August 24, 2017. Retrieved February 13, 2018. ^ a b Gerstmann, Jeff (July 12, 2011). "Super Mario 64 Virtual Console Review". GameSpot. CBS Interactive. Archived from the original on August 24, 2017. Retrieved February 14, 2018. ^ Radakovic, Nebojsa (June 6, 2004). "Super Mario 64 Review". GameRevolution. Evolve Media. Archived from the original on February 15, 2018. Retrieved February 14, 2018. ^ East, Tom (March 2, 2009). "100 Best Nintendo Games - Part 6". Official Nintendo Magazine. Future. Archived from the original on July 14, 2014. Retrieved February 14, 2018. ^ a b "What do you mean, you've never played... Super Mario 64". Official Nintendo Magazine. Future Publishing (5): 17. July 2006. ^ a b "GameSpy's Top 50 Games of All Time". GameSpy. July 2001. Archived from the original on March 3, 2012. Retrieved February 14, 2018. ^ a b "Who Dares Wins". Edge. Future Publishing (177): 62–71. July 2007. ^ "Top 25 Greatest Nintendo Games – No. 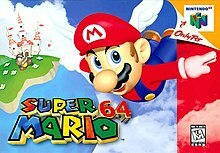 7 Super Mario 64 (N64)". GameDaily. Archived from the original on March 12, 2008. Retrieved February 9, 2008. ^ a b Craig Glenday, ed. (March 11, 2008). "Record Breaking Games: Platform Games". Guinness World Records Gamer's Edition 2008. Guinness World Records. Guinness. pp. 108–110. ISBN 978-1-904994-21-3. ^ "Most Influential Video Games". GameDaily. Archived from the original on June 18, 2009. Retrieved January 23, 2008. ^ gamesTM Staff (November 2007). "Super Mario Galaxy Review". gamesTM. Imagine Publishing (63): 129. ^ Seavor, Chris; Pile, Shawn; Marlow, Chris (June 25, 2013). Conker's BFD : Director's Commentary Prt 7. Conker King. Archived from the original on February 12, 2017. Retrieved January 12, 2015 – via YouTube. ^ "The Making of GoldenEye 007". Zoonami. September 2, 2004. Archived from the original on July 18, 2011. Retrieved February 11, 2006. ^ Houser, Dan (November 9, 2012). "Americana at Its Most Felonious: Q. and A.: Rockstar's Dan Houser on Grand Theft Auto V" (Interview). Interviewed by Chris Suellentrop. New York Times. Archived from the original on September 26, 2013. Retrieved March 3, 2015. ^ "Sakurai x Nomura". Famitsu. Enterbrain (1415). January 2016. ^ "Sakurai x Nomura: Creator Interview 2016". Source Gaming. January 21, 2016. Archived from the original on January 23, 2016. Retrieved January 21, 2016. ^ "Everything Old-School is New Again". Nintendo Power. Future Publishing (Winter Special 2008): 42. Winter 2008. ^ "N64 Exclusive". Nintendo Power. Nintendo (85): 16–17. June 1996. ^ IGN Staff (November 13, 1996). "In Search of Luigi". IGN. Archived from the original on November 11, 2007. Retrieved October 11, 2007. ^ IGN Staff (November 20, 1996). "Luigi Still Missing". IGN. Archived from the original on October 8, 2007. Retrieved October 11, 2007. ^ "April News Briefs". Nintendo Power. Nintendo (107): 80–81. April 1998. ^ Hernandez, Patricia (July 8, 2014). "The Super Mario 64 Coin That Took 18 Years To Collect". Kotaku. ^ "The Smithsonian Has Picked the Games of Its Art of Video Games Exhibit". Kotaku. May 5, 2011. Archived from the original on November 6, 2010. ^ "The Art of Video Games". Smithsonian American Art Museum. Archived from the original on January 10, 2011. ^ Nintendo SpaceWorld '96: Miyamoto Interview + Super Mario 64 on 64DD + Rumble Pak Unveiled. Archived from the original on January 9, 2015. Retrieved September 2, 2014 – via YouTube. ^ "N64.com Interviews Howard Lincoln". IGN. December 6, 1996. Archived from the original on February 6, 2015. Retrieved January 11, 2015. ^ Super Mario 64 Disk Version - Boot on 64DD. Archived from the original on January 11, 2015. Retrieved January 25, 2015 – via YouTube. ^ "Shindou Super Mario 64 (Rumble Pak Vers.)". IGN. Archived from the original on February 23, 2011. Retrieved October 22, 2006. ^ Davies, Jonti. "Shindou Super Mario 64". Allgame. Archived from the original on November 15, 2014. Retrieved October 22, 2006. ^ Thomas, Lucas M. (January 10, 2007). "Super Mario 64 VC Review". IGN. Archived from the original on October 9, 2008. Retrieved September 17, 2008. ^ Gerstmann, Jeff (November 19, 2004). "Super Mario 64 DS Review". GameSpot. Archived from the original on November 5, 2011. Retrieved October 22, 2006. ^ "Super Mario 64 DS (ds: 2004): Reviews". Metacritic. Archived from the original on January 22, 2009. Retrieved April 18, 2008. ^ "Super Mario 64 DS Reviews". GameRankings. Archived from the original on April 6, 2008. Retrieved April 18, 2008. ^ "Financial Results Briefing for the Fiscal Year Ended March 2008: Supplementary Information" (PDF). Nintendo. April 25, 2008. p. 6. Archived (PDF) from the original on September 10, 2008. Retrieved August 3, 2008. ^ eTeknix.com (April 1, 2015). "Nintendo Takes Down Super Mario 64 Unity Remake - eTeknix". Archived from the original on December 22, 2016. Retrieved December 30, 2016. ^ Albert, Brian (March 31, 2015). "Nintendo Takes Down Super Mario 64 HD Fan Project". Archived from the original on December 31, 2016. Retrieved December 30, 2016. ^ a b "Super Mario 64 II". IGN. Archived from the original on September 25, 2008. Retrieved October 16, 2008. ^ "Gaming Gossip". Electronic Gaming Monthly. No. 85. Ziff Davis. August 1996. p. 30. ^ Takao Imamura, Shigeru Miyamoto (August 1997). "Pak Watch E3 Report "The Game Masters"". Nintendo Power. Nintendo: 104–105. ^ IGN Staff (May 11, 1999). "Nintendo Sequel Rumblings". IGN. Archived from the original on February 23, 2011. Retrieved December 7, 2008. ^ Gantayat, Anoop (August 21, 2006). "Miyamoto Opens the Vault". IGN. Archived from the original on April 26, 2010. Retrieved October 22, 2007. ^ "The Making of The Game Super Mario Sunshine". Nintendo Online Magazine. N-Sider. August 2002. Archived from the original on December 2, 2008. Retrieved October 22, 2007. ^ "Super Mario Galaxy Video Review". GameTrailers. November 7, 2007. Archived from the original on May 19, 2009. Retrieved December 7, 2007. ^ "Level Comparison: Whomp's Fortress". GameTrailers. May 21, 2010. Archived from the original on May 24, 2010. Retrieved June 7, 2010. ^ Otero, Jose. "Super Mario 3D World Review". IGN. Archived from the original on December 26, 2016. Retrieved January 18, 2017. ^ Plante, Chris. "Super Mario Odyssey is an open-world sandbox game for Nintendo Switch". The Verge. Archived from the original on January 14, 2017. Retrieved January 18, 2017.